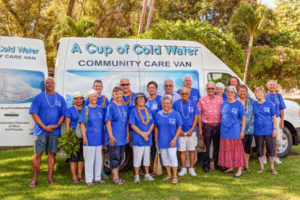 A Cup of Cold Water (ACCW) is a community Care-Van outreach program on the Island of Maui, formed by a group of committed Episcopalians from Good Shepherd, Holy Innocents, St. John’s and Trinity By-the-Sea. The program is a food and clothing distribution service for the poor and needy in the community, and uses the care-van to deliver essential food, hygiene and clothing items throughout the island. With a strong volunteer base from the Episcopal Churches on Maui, the program is growing and now includes churches from various denominations. We greatly welcome donations of the below listed items along with gas cards (gas up the Van), Maui Bus passes (for clients transportation) and monetary donations of any amount! Non perishable food items that have a long shelf life examples include: granola bars, energy bars, pop top cans goods, dried fruits, raisins, trail mix, pretzels, nuts, cookies, rice krispy treats, puddings, fruit rolls, pop top (fruits, vegetables) snacks, nori, pop top meats (tuna, sardines, vienna sausage) small peanut butter packs, cheese/crackers, separately sealed crackers etc…. perishable food items of any kind. ACCW can be reached directly at 808-419-1637 or by email to acupofcoldwatermaui@gmail.com. 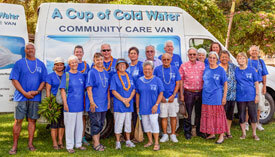 Mahalo nui loa for your love and support of A Cup of Cold Water and the people they serve.